Anaplasmosis is a tick-borne disease. Anaplasma Pyagocytophilum is the bacterium that causes this disease. It can be transmitted to your pet by the western black-legged tick and deer tick or black-legged tick. Another form of anaplasmosis is caused by the bacteria Anaplasma Platys and is caused by the brown dog tick. Read on to find out more about the symptoms and treatment associated with anaplasmosis. The less common signs that pets infested with A. phagocytophilum show are vomiting, coughing, diarrhea and labored breathing. The less common signs that pets with A. platys show are bruising and bleeding including nosebleeds. Your veterinarian will run several types of tests like polymerase chain reaction (PCR), indirect fluorescent antibody (IFA), and enzyme-linked immunosorbent assay (ELISA). Your veterinarian will determine various test options and the best diagnostic protocol for your pet. Some of the tests will be conducted in a commercial veterinary laboratory as they can’t be performed at a veterinary hospital. 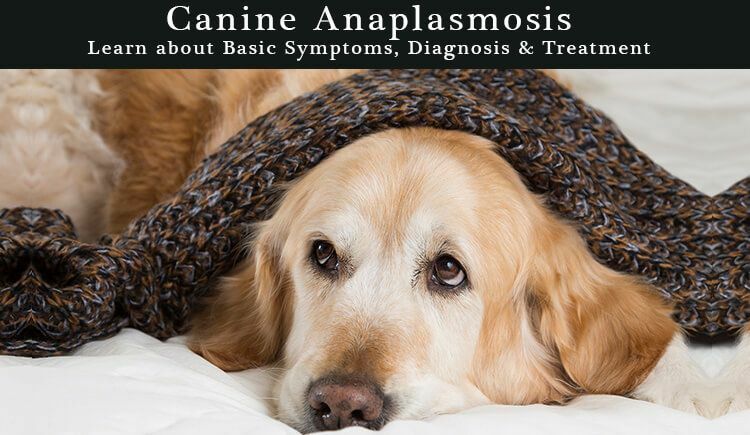 Treatment for canines infected by anaplasmosis is done by treating your pet with antibiotic doxycycline. This treatment is also carried out for other commonly occurring tick-borne diseases like the Lyme disease. In the majority of cases, the pet is treated for 30 days. The pet will start showing signs of improvement within 24 to 48 hours of administration. A study demonstrated that almost 40% or more of dogs in areas where Lyme or anaplasmosis are common will be seropositive. The dogs residing in such areas should have an aggressive tick control program implemented to avoid this tick-borne disease. If you feel your pet is showing any such symptoms contact your veterinarian immediately and he will recommend the correct form of treatment for your pet.